Can you bear the thought of not finishing your chocolate? Do you just have to have another one (then another one and another one)? Do you love every single type (except dark chocolate… that's only for sadists)? Does the mere thought of cocoa get you thinking about chocolate? Are you always looking for somewhere new to try yet another type of chocolate? Can you see a downside of chocolate… nothing comes to mind? Um…now you've answered all these own questions you can self diagnose. Chocolaholics rejoice… there's always more chocolate to try if you know where to find it. According to me (and many millions of chocolate lovers), chocolate is one of the healthiest addictions around. Well, it's certainly the yummiest. 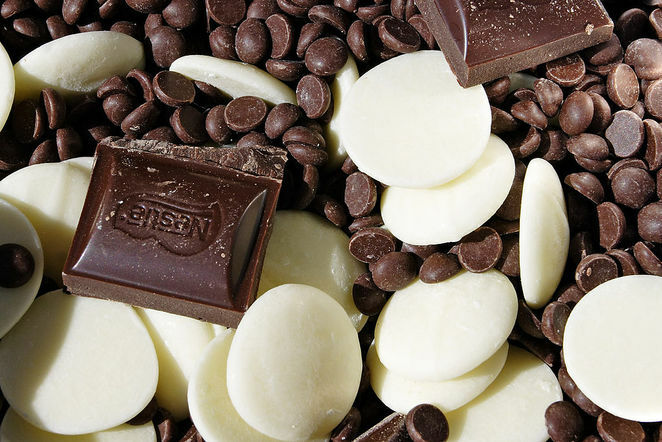 White chocolate doesn't contain any cocoa solids and therefore isn't technically a chocolate. I hope it's technically a vegetable so I can eat more of it and feel less guilty. The inventor of the chocolate chip cookies sold the idea to Nestles for a lifetime of chocolate. Maybe he should have asked for money so he could have bought the whole damn factory. M&Ms were created in the forty's for soldiers to enjoy without it melting. I knew it…chocolate is a lifesaver. Every second Americans collectively eat 100 pounds of chocolate. I'm sure we can do better than that! Eating dark chocolate has health benefits. Apparently chocolate everyday reduces heart disease by one third and protects against tooth decay (not endorsed by dentists). In 2013 Belgium issued a limited range of chocolate flavoured stamps. What a stroke of genius to rejuvenate the snail mail industry. There are more articles written about this topic. Probably more than just about anything else! That has to tell you something. There's even a group called Chocolaholics anonymous. They even have a party plan in Australia and just about the only one I have never had. I can't believe I have never before come across this most indulgent party plan. If you have stuck with me this far then you really are a teeny bit addicted. Therefore you will love some of the following places to buy chocolate of all shapes, colors and prices. The store was the first café style chocolate shop in Melbourne producing chocolate for customers to eat, sample or sip while relaxing in a modern styled café. Hahndorfs have used the feedback from customers over the years to develop their delicious range. They now sell over 70 products including handmade truffles, chocolates, chocolate boxes and hampers. Hahndorfs have ready-made gifts for a range of budgets. Chocolate trays of five pieces start from $6.50, mini hampers for $9.50 up to $200. You can order on line and have them delivered. Enjoy a hot chocolate ($4) or oversized milk shake ($5.50) and take the little ones, as Baby chinos are only 90c. 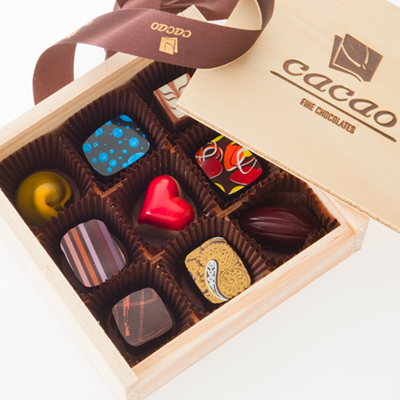 Cacoa make individually hand made chocolates that are like a work of art. They sell an exclusive range of chocolates like nothing sold in supermarkets. The cheapest individual mouth sized chocolate treat is $2. Chocolates come in boxes for special occasions and can be gift-wrapped. With the range of sweets and treats they have I am surprised that the Salted caramel macaron is one of most popular purchases. Cacao also sell freshly baked pastries, macarons, savouries, baguettes and sumptuous cakes. They can create hampers, party boxes, sell gift vouchers, wedding bonbonniere and wedding cakes. They sell the usual hot drinks such as hot or iced chocolate made from Belgium chocolate. Cacao also have stores in Fitzroy Street St Kilda, Rosamond Road Maribyrnong and on the cnr of Bourke and Elizabeth Streets, Melbourne. If you just have to have their chocolates now you can shop on line for their 4 hr delivery (Melbourne Metro only). This is another great café in a lovely bush setting with the showroom having beautiful valley views. They are well known for their generous free chocolate tastings. They have a well-frequented café with homemade ice creams, decadent pastries and ironically 'light lunches' to make sure you have room for the chocolate. handcraft chocolate while you are choosing your next treat. They have a staggering 150 varieties! The chocolate club sounds very appealing to me. This is for serious chocolate lovers who like to make chocolate the main course. They have all sorts of delicious chocolate drinks but that's just part of the fun. Chocolate waffles (from $6), decadent pastries and fondues (19.90 for two)…what's your chocolate pleasure? If you like you can create your own hot chocolate shot. A classic chocolate is your cheapest bet from $5.90. Add a few dollars for their milk shakes, icy frappes or other choctails. Of course they also have plenty of chocolates you can buy for gifts or to spoil yourself. I rather fancy their pralines. There are many Max Brenner chocolate bars. They are usually located in shopping centres and open long hours (often to midnight). I'm hanging out for a chocolate pizza! Move over the Windsor… this is a decadent and indulgent high tea at a regal red and gold parlor. The host is Hanna Frederick who clearly loves to entertain and spoil the guests. Champagne and delicious handmade chocolates made by Hanna herself accompany the high tea. Chocolate scented with lemon grass means two of my loves combined. Read Julie Mundy's review for her evaluation of the unique chocolate range. Some examples include: rosemary and sea salt, kangaroo salami dark chocolates, strawberry and black pepper, chocolate dipped Mildura oranges, absinthe and anise, green tea wasabi, pumpkin pie and brandied sour cherry in dark chocolate which you have to drink before you eat. High tea is a reasonable price between $25-$55 per person. Bookings are essential. Just outside of Daylesford, you'll find a quirky little chocolate factory. 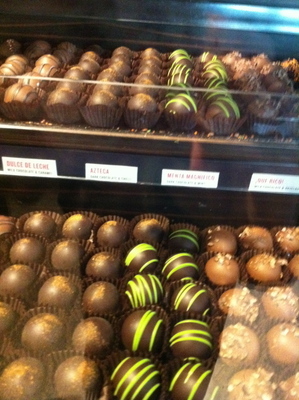 It's worth the drive if you want some inexpensive chocolate. The Chocolate factory imports Belgium chocolate and creates handmade chocolates and truffles. They conduct free demonstrations of the chocolate making process. They also run a café serving hot chocolate (only $5 for a large mug), ice cream (just $3 for two large scoops) and cakes. The children can play on the equipment while you enjoy your hot Belgium chocolate. The Chokolait Emporium or the Chocolate Kettle for lollys and chocolates. The Ganache Chocolate Lounge is a classy little shop and the Chocolate Apple Factory has some unique healthy takes on chocolate. For the most decadent tour in town take the Chocolate Walking Tour in Melbourne CBD. You will visit eight delicious venues, learn about chocolate creation and best of all get discounted chocolates! As if it wasn't enough in a solid form. There are many places around Melbourne that pride themselves on their hot chocolate drinks. Have a look at Julia's suggestions. With so many possibilities 'Where's the Best Chocolate Cafe in Melbourne?' read Vanessa's review. Several people have bought into this debate and have added their suggestions. Your comments are most welcome here. I can't believe you missed Koko Black. Absolutely the best available, their champagne truffles are to die for. They also do a great range of plates and drinks. Here's the remedy- eat more chocolate! Congratulations for winning third prize. Yum I love chocolate and I am a chocoholic for sure. Great article. Best Hot Chocolate in Melbourne is Choclatte in Camberwell. Guilty as charged, I am definitely a chocoholic!